In a quiet seaside town near Genoa, experts are gathering for a linguistics conference. One speaker, Philipp Perlmann is recently widowed and, struggling to contend with his grief, is unable to complete his keynote address. As the hour approaches, an increasingly desperate Perlmann decides to plagiarize the work of Leskov, a Russian colleague who cannot attend, and pass it off as his own. 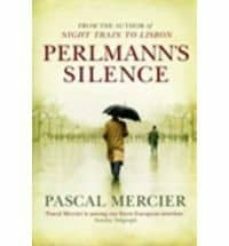 But when word reaches Perlmann that Leskov has arrived unexpectedly in Genoa, Perlmann must protect himself from exposure by constructing a maelstrom of lies and deceit, which will lead him to the brink of murder. In this intense psychological drama, the author of Night Train to Lisbon again takes the reader on a journey into the depths of human emotion and the language of memory and loss.